SUPPORT FOR A constitutional amendment giving the Oireachtas the power to carry out inquiries has fallen significantly as the vote approaches, a new poll has found. According to the latest Irish Times/Ipsos MRBI poll, opposition to the move has more than doubled to 20 per cent from 8 per cent since earlier in the month. There is still a significant majority in favour, with 57 per cent backing the motion; however, this number has fallen by eight per cent. 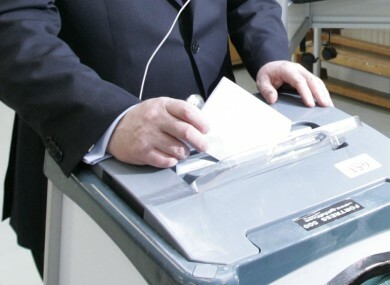 Some 23 per cent of people are undecided or said they would not vote. The changes come amid sometimes heated debate on the amendment. The technical group of independent TDs has come out against it, with Stephen Donnelly arguing in TheJournal.ie this morning that the measure puts individual rights at risk. The Irish Council for Civil Liberties has also been campaigning against it. However, the Fine Gael/Labour coalition is strongly backing the amendment, with heated exchanges between Government TDs and those Independents opposing it. The poll also shows a slight drop in support for the constitutional amendment on judicial pay cuts, with 85 per cent now in favour, down from 88 per cent. Only seven per cent of people said they would vote against it, but this has risen from four per cent earlier this month. The poll appears to reflect broad support for the Government. Ratings for Fine Gael and Labour have climbed by one and two per cent respectively, while those for all opposition parties fell slightly. Taoiseach Enda Kenny also saw his personal rating climb by one per cent. However, Labour leader Eamon Gilmore’s fell by the same amount. Email “Support falls for Oireachtas inquiries amendment - poll”. Feedback on “Support falls for Oireachtas inquiries amendment - poll”.